Professionals in a branche brought up-to-date by a few experts. How can we enhance the knowledge support to our 11.000 financial advisors online? We introduced 70/20/10 and started with sessions on topics, followed by making mortgage experts bookable to their members. Employees learn various topics easily, with expert coaches. How can we enhance the knowledge of 200 employees on new healthcare regulation? We introduced online learning content (SPOC’s) and live classes that were hosted by their own experts. How can we activate our customers (young and old) to learn about our online photo album software? 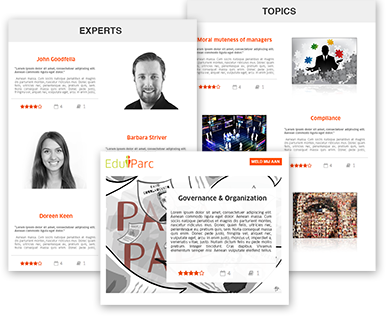 EduParc delivered a team of professionals and their learning platform in HEMA look-and-feel in a few weeks. More than a 1000 customers booked e-learning with live online sessions about HEMA photo services. EduParc even did the custom HEMA support to handle all questions on phone, chat, email. The evaluation of the sessions were 4,5 stars out of 5. Trainers and participants (from the age of 13 to 83 years) were both surprised about the engagement online which exceeded their expectations. We activate and accelerate your performance with less time spend on training and more fun. And better insights for you and your organisation. Join us and be part of our journey. See the trailer below to see how what we mean with accelerate. We let your employees work on their personal profile, which resembles their actions and ambitions. Trainings cost a lot of time. Therefore we give only short relevant learning steps that are easy to follow-up in their busy work schedules. Employees will master the right topics and skills that help them do their job better tomorrow. How is this done? EduParc has a way to do this very effective. The employee and your organisation will have great insights in skills / expertise gaps and progression. 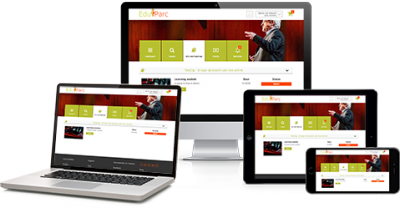 EduParc has developed a way to make learning and measuring engaging and effective for all users. All done by presenting relevant and necessary information in easy steps, clear views. All online, so at you fingertips. For this we created an environment that is available on all devices. Whether you do some e-learning, talk to a coach or receive messages, reminders or information from other experts, it’s available on your device, mobile or not. We are where our users are. Which learning tools do you have already? An LMS for reporting, keeping track on progression, work-flows, synchronisations with your HR systems? Authoring tools to create content and choose from templates with quizzes, games, great presentations, interactive video’s? Virtual Classrooms with possibilities to organise webinars or coaching sessions maybe? e-Learining content catalogue from several suppliers? EduParc has got you covered on all these items. We can even integrate with your HR system and existing content. That’s why EduParc gives you your own academy that is set-up in a few minutes. Almost everything is automatically generated. 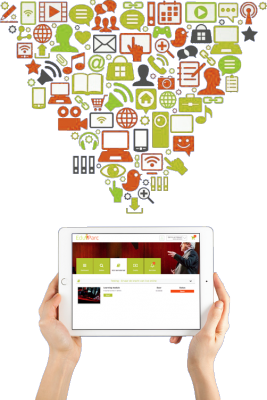 It’s in your own look-and-feel with images, video’s and explanations about the academy and courses for your employees. All presented with a clear view of the topics and experts so employees feel engaged and can choose easily. There is extra information about reviews, e-learning material and experts to help their proces. That’s how you can support the professional growth of employees.